Drivers are events or conditions that motivate an enterprise to change some aspect of its goals and consequently its objectives, and potentially business activities or technical solutions. The drivers can be top-down in the form of strategic drivers. such as regulatory compliance rule changes, or bottom-up in the form of tactical drivers such as technology changes or opportunities that have been discovered by audits, performance assessment, surveys or other mechanisms. 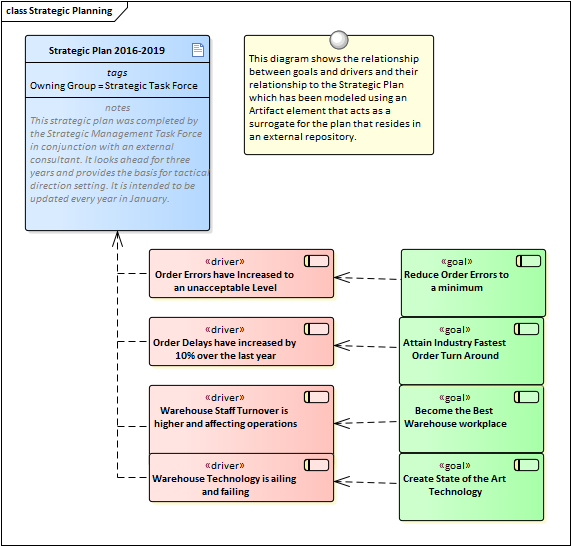 Enterprise Architect has support for modeling both strategic and tactical drivers with the use of a stereotyped driver element that can be linked to goals and other organizational elements to show how the organization must respond. This section lists the main tools available in Enterprise Architect that can be used to perform Driver Modeling. There is also a wide range of additional tools that a modeler might find suitable when applying the technique in a particular context. The complete list of tools is available from the topics Meet the Enterprise Architecture Tools and Additional Enterprise Architecture Tools. Neither the Unified Modeling Language nor Enterprise Architect have a built-in element to represent Business Drivers, but they can be included using Stereotypes, which is a mechanism for extending the core language. These stereotypes can be applied to a base element such as a Requirement and then the stereotype can be applied to create new Drivers. The stereotype will be visible in the Project Browser and Diagrams if these options have been set. These stereotyped elements might be available if other Technologies or profiles have been enabled. The Traceability Window is a powerful view that allows a modeler to visualize the connections between elements in the repository, regardless of whether the relationships exist in diagrams. This is useful to show how Drivers relate to each other and how they are connected to other elements in the model and in turn how those elements are connected. Drivers can be related to other business architecture elements such as Goals and Objectives and applications architecture elements such as Application Services and Applications and more and all of these relationships are visible through the Traceability window.